Pope Saint Hilarius (also Hilarus, Hilary) was the bishop of Rome from 461 to February 28, 468. Earlier he was Pope Leo I's envoy to the synod of Ephesus in 449, known as the "Robber Synod." At great personal risk, he opposed the deposition of Patriarch Flavian of Constantinople and unsuccessfully supported the condemnation of Eutychianism, a heresy which taught that Christ's divinity overshadowed his human aspect. Hilarius then fled from Ephesus to Rome. He was elected bishop of Rome probably on November 17, 461, and was consecrated November 19. As pope, he promoted the authority of Rome both within the Christian church and vis a vis the imperial power of Constantinople. He left several letters dealing with church administrative matters and discipline and was responsible for a major change in the liturgy of the mass. In 465, he presided over the oldest Roman synod whose records are still extant. During his brief papacy, he also built several churches, convents, and public buildings. Hilarius died on February 28, 468. Honored as a saint in the western church, his feast day is celebrated on November 17 or February 28. Hilarius was a native of Sardinia and served as archdeacon at Rome before becoming pope. When still a deacon, he was sent as a legate of Pope Leo I to the Second Council of Ephesus in 449 C.E., which had been called as an ecumenical council under Patriarch Dioscorus of Alexandria at the emperor's behest. Patriarch Flavian of Constantinople had earlier (November 8, 448) presided over a synod which condemned the leading Alexandrian monk Euthyches on charges of Monophysitism. The emperor was concerned that taking a harsh stand against anti-Nestorian churchmen such as Eutyches was causing division within the empire. However, the western church agreed with Flavius in interpreting the anti-Nestorian attitudes of Eutyches as essentially pro-Monophysite. The question before the council at Ephesus was whether Flavian had justly excommunicated Eutyches for allegedly refusing to admit "two natures"—both divine and human—in Christ. Flavian and six other anti-Monophysite bishops who had been present at Constantinople were not allowed to sit as judges at Ephesus. Moreover, the synod was organized hastily, so that few western representatives were present. This left Hilarius, who was a mere deacon among bishops, in a key position, but a vulnerable one. Pope Leo intended that his dogmatic letter supporting Flavian's position should be read at Ephesus and accepted as a rule of faith. Patriarch Dioscorus, however, did not allow it to be read. 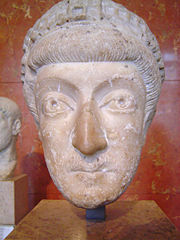 Instead, a letter of the Emperor Theodosius II was proclaimed, ordering the presence at the council of the anti-Nestorian monk Barsumas. Eutyches then was introduced and declared that he held to the Nicene Creed, stipulating that Christ is both true God and true man, to which nothing could be added. He claimed that he had been condemned by Flavian for a mere slip of the tongue. However, his affirmation that Christ held “two natures before, one after the incarnation,” confirmed to many that he was indeed a Monophysite heretic who denied Christ's humanity. Dioscorus, however, supported Eutyches, who was his fellow Alexandrian. He and the majority of the delegates anathematized Flavian and declared him to be deposed. Anatolius, a partisan of Dioscurus, was appointed to succeed Flavian as patriarch of Constantinople. The preserved proceedings of the council indicate that Hilarius protested the deposition of Flavian in the pope's name. Reportedly, Flavian was physically attacked by his opponents so violently that he died three days later in his place of exile. Eutyches, meanwhile, was exonerated of the charges of heresy. Fearing for his own life, Hilarius escaped and traveled by back roads from Ephesus to Rome. The Second Council of Ephesus was immediately repudiated in the west and later in the east as well. It came to be called the Robber Synod by its critics. In a letter to Empress Pulcheria, collected among the documents of Leo I, Hilarius apologizes for not delivering to her a letter of Leo I after the synod, explaining that he had been hindered by Dioscorus. In Rome, he was made archdeacon. Hilarius became pope on November 19, 461, succeeding Leo I, who had died nine days earlier. In his brief reign as pope, Hilarius successfully asserted the authority of the papacy over the churches of Gaul and Spain and made significant reforms to the Roman liturgy. He also counteracted the imperial toleration of heresy and built or improved several churches. Hilarius continued and furthered the policy of his predecessor Leo, who in his efforts to establish papal authority in Gaul had obtained from Emperor Valentinian III a famous prescript (445) confirming the supremacy of the bishop of Rome. Hilarius objected to the appointment of a certain Hermes, a former archdeacon, as bishop of Narbonne in today's France, without the express sanction of the previous pope. Hilarius then convoked a synod in 462, which confirmed Hermes as official bishop, thus establishing a precedent implying a papal veto over the nomination of bishops, even though the veto was not exercised in this case. Hilarius also dictated that no bishop could leave his diocese without a written permission from his metropolitan. Church property, he decided, could not be sold to other owners until a synod had examined the cause of sale. In 463, Hilarius involved himself in another diocesan quarrel in Gaul. Bishop Mamertus of Vienne had consecrated a bishop of Die, although this church belonged to the metropolitan diocese of Arles, by a decree of Leo I. When Hilarius heard of it he deputed Bishop Leontius of Arles to summon a synod of the bishops of several provinces in order to investigate the matter. After receiving its report, Hilarius issued an edict dated February 25, 464, in which Mamertus was warned that his authority would be withdrawn if in the future he did not refrain from unsanctioned ordinations. Thus the privileges of the see of Arles were upheld as Leo I had defined them. At the same time the area's bishops were admonished not to overstep their boundaries. Hilarius also issued an encyclical instructing that although a synod was to be convened yearly by the bishop of Arles, all important matters were to be submitted to the Apostolic See in Rome. He also issued rulings to the churches of Hispania, an area which had tended to operate outside the papal orbit earlier in the fifth century. 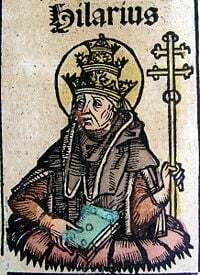 Silvanus, bishop of Calahorra, had allegedly violated church laws by his episcopal ordinations, and the pope was asked by other local bishops for his decision on the matter. Before an answer to their petition came, the same bishops again appealed to the Holy See on an entirely different matter. Before his death, Bishop Nundinarius of Barcelona expressed a wish that a certain Irenaeus might be chosen his successor. A synod at Tarragona confirmed the nomination, after which the bishops sought the pope's approval. The Roman synod of November 19, 465, held in the Basilica of Santa Maria Maggiore, which settled the matters, is the oldest Roman synod whose original records have survived. In Rome, Hilarius worked zealously to counter an edict of the new emperor, Anthemius, establishing toleration for schismatic sects (467). The policy of toleration was reportedly inspired by a favorite of Emperor Anthemius named Philotheus, who espoused the Macedonian heresy, a semi-Arian doctrine which allegedly denied the personal divinity of the Holy Spirit and affirmed that Christ was not of the "same" substance as God the Father. On one of the emperor's visits to Saint Peter's Basilica, Pope Hilarius openly called the emperor to account for his favorite's conduct, exhorting him by the grave of Peter to promise that he would allow no schismatic assemblies in Rome. Another aspect of Hilarius' legacy was the institution, in 467, of the new mass, a complete revamping of Catholic liturgy meant to modernize church rituals, which were considered too obscure for the new generation of converts and returning schismatics. Hilarius erected several churches and other buildings in Rome, for which the Liber Pontificalis praises him. These include two oratories in the baptistery of the Lateran, one in honor of John the Baptist, the other of John the Apostle, to whose protection he attributed his safe escape from the Council of Ephesus. He also erected a chapel of the Holy Cross, convents, two public baths, and libraries near the Basilica of St. Lawrence outside the Walls, in which church he was buried. His feast day is celebrated on November 17 or February 28. Hilarius is best remembered for his courage at the "Robber Synod" of Ephesus, where he risked his life as Pope Leo I's representative in supporting the condemnation of Eutychus, in opposition to the imperial policy. He also opposed Caesaropapism during his own papacy and did much to further the authority of Rome over the western churches of Gaul. Finally, he built or improved several church in Rome, and he reformed the Catholic liturgy to make it more easily accepted by recent converts and returning heretics as well. This page was last modified on 22 May 2015, at 20:00.